Frazier married her fiance, real estate agent Aaron Williams, on Saturday, March 18 in an outdoor ceremony in Conroe, TX. "The memory of that day will last a lifetime. I'm still in amazement with the whole thing," Frazier captioned a photo of her bridal bouquet of white flowers on Tuesday. "Quick details: Aaron and I got married at his parents estate overlooking their lake, in front of 180 of our closest loved ones. It's the same lake that 12 years ago I over looked with him and said to myself that I'd marry him at. God granted that dream and vision. No doubt I am extremely lucky. Aaron couldn't be more perfect for me. It was a fairytale wedding!" Frazier, 36, donned a sleek, form-fitting dress with a plunging V-neckline and embellished belt around the waist. 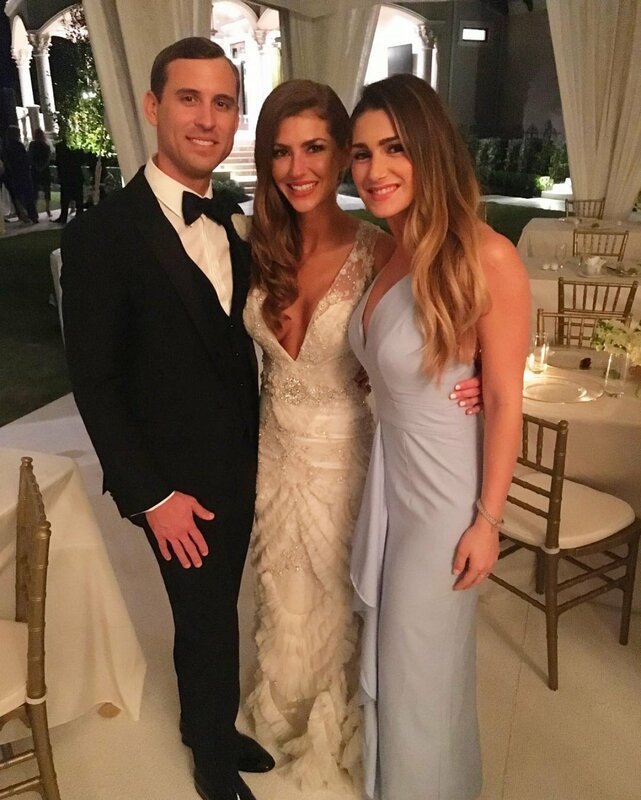 Frazier and Williams' wedding guests included fellow former The Bachelor bachelorettes Elise Mosca and Erica Rose, who described her friend as "the most stunning bride" in an Instagram post. Mosca also posted a video on social media of the bride and groom's lakeside ceremony, and Frazier could be seen getting emotional as she recited her vows. Frazier and Williams were friends for 10 years and dated for only 11 months before Williams proposed with a three-carat, oval-cut diamond ring on the Brooklyn Bridge in New York on November 5 during a vacation together, Us Weekly reported. Frazier, who currently runs a lifestyle and fashion blog from Houston, TX, finished third on Season 17 of The Bachelor. She memorably left the show steaming from the ears and declining to say a word to Lowe after he dumped her. Lowe is still happily married to the woman he picked at the end of his journey, Catherine Giudici, and they have a baby boy together. Frazier later appeared on Season 1 of Bachelor in Paradise. The former personal organizer dated Graham Bunn for most of her Paradise stint but they split at the end. In addition to Lowe and Bunn, Frazier also previously dated Brad Womack in early 2013 and Michael Garofola in late 2013 from the Bachelor family.